Did I say this tour was going to take a super fun turn or what?! 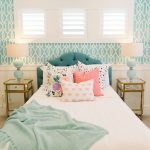 You can tell Cristi and her designer Lindy Allen of Four Chairs Furniture had a blast decorating the adorable playroom upstairs. Cristi refers to it as the “keiki” room (keiki is how you say kids in Hawaiian) because it has a Hawaii feel to it (surf board shelves, sea turtles, surf pillows, etc). Some of you eagle-eye readers might even recognize the nursery. I actually featured the little guy’s room from their old house last year here. 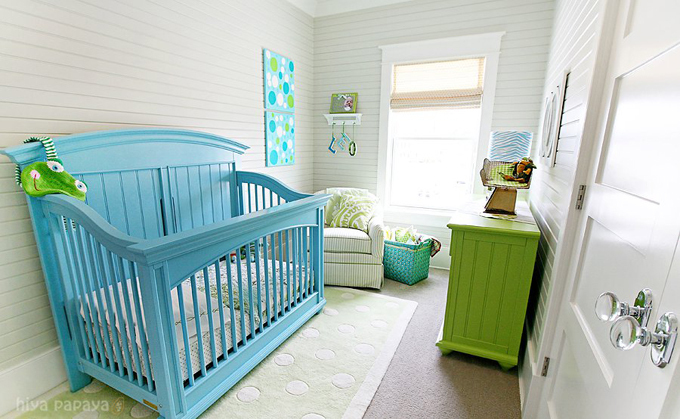 Glad to see the gorgeous turquoise crib is still taking center stage! And the nursery bathroom! Get this…the claw foot tub actually came from the farm Cristi grew up on. Her parents used it out in the pasture to put the salt licks for the cows in. Seriously! Now it’s refinished, looks gorgeous, and she will be bathing her children in it! LOVE. IT. 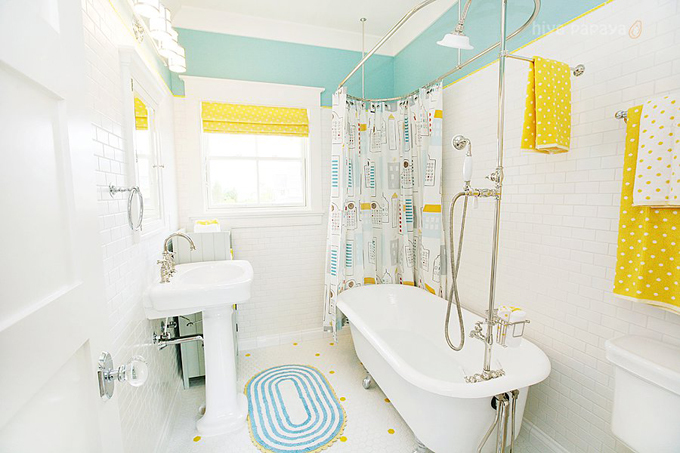 The beautiful tile here was all done by Greg’s Tile Creations…the touch of yellow is so fun! 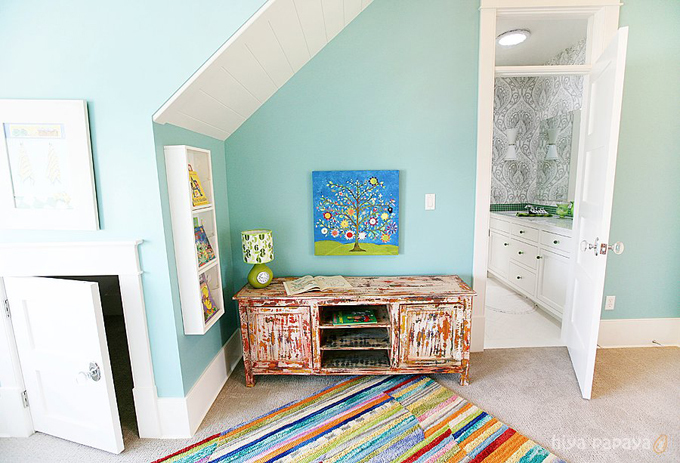 There’s not a ton of turquoise floating around in it, but I just had to include Cristi’s oasis: her office/craft room. The builder Hatfield Homes outdid themselves here! I can’t even imagine what a treat it would work from this room, high above the trees with all that light flowing in and the soaring ceiling! 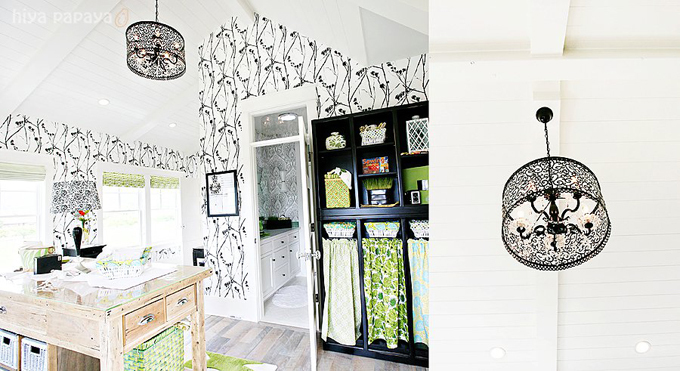 Love that black and white wallpaper (Thibaut’s Blossom from Natural Resource) mixed with all the fresh greens. 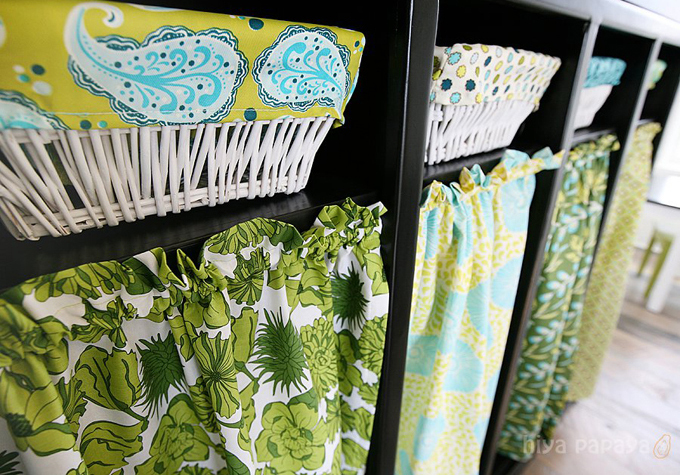 The colorful curtain fabric and basket liners are all way too cute!! But wait…there’s more!!! We’re moving on downstairs now…you guys have to see this basement. It’s a lot different than the main floor, but oh-so-fun! Cristi and Jeff’s basement is ready for a par-tay! I swear I’d give up Diet Coke for that theater room! Jeff wanted the second row of seats to be higher than the first – so you can see the screen if you’re sitting in the back. But he also wanted a “stage” that was moveable so if they’re having a party down there, they can just move it out of the way. Brilliant! 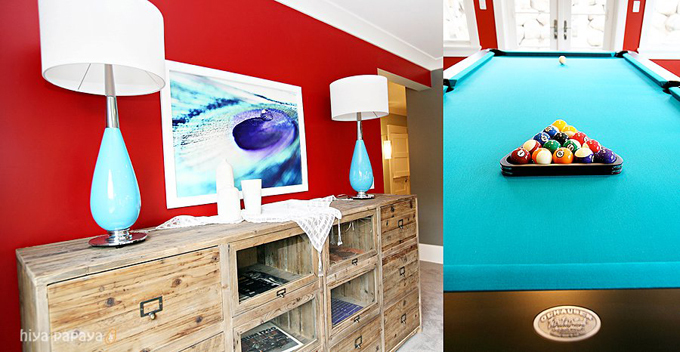 That turquoise pool table is pretty darn brilliant too. 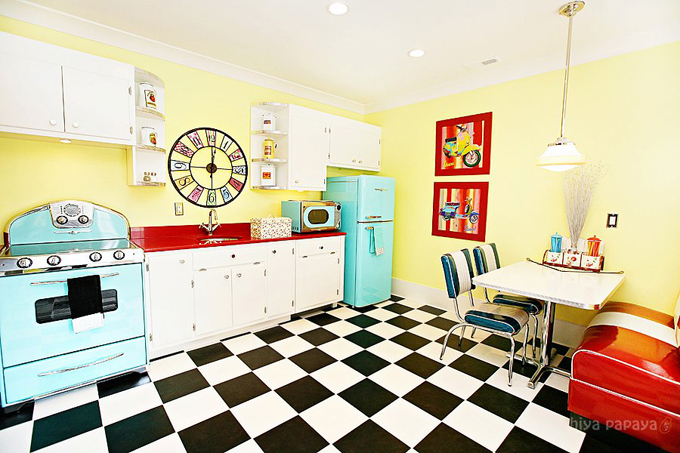 As is the retro kitchenette! Seriously, Cristi, do you want me to move in?! 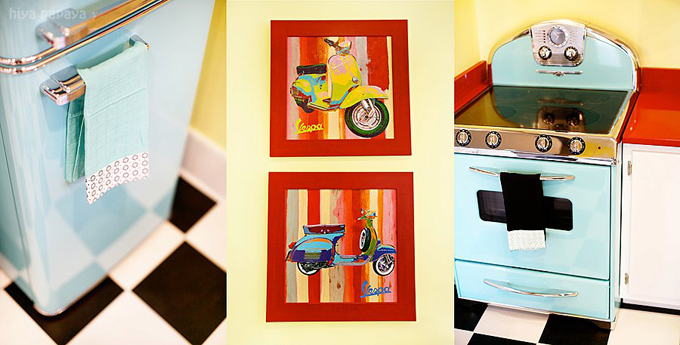 I’m such a die-hard fan of Elmira Stove Works…I don’t get to see their turquoise appliances nearly enough! Sooo perfect here. They are an excellent fit with the cabinets done by Benjamin Blackwelder. So fun!!! Phew, that was a lot of photos! Believe it or not, I still have a slew left for tomorrow. The master bedroom and bathroom are straight out of magazine, so be prepared for some major drool! 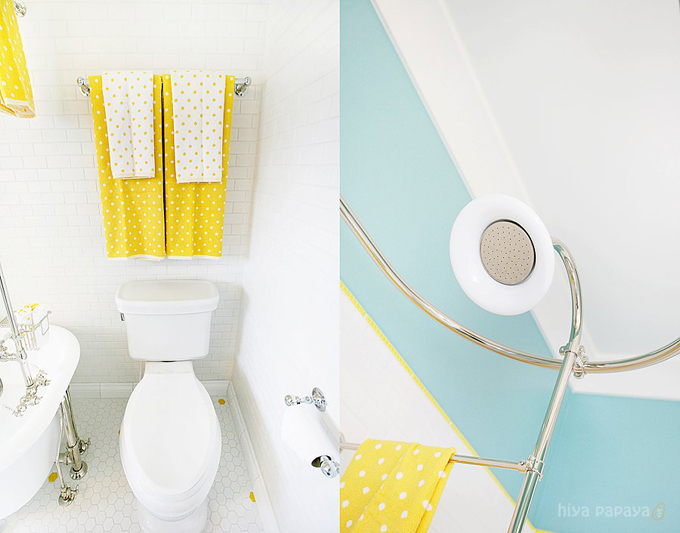 Once again, a HUGE thank you to homeowner Cristi and Jessi Safsten of Hiya Papaya for all these amazing images! And Cristi, thank you for being so generous with all of your sources! We truly appreciate it! –Check out Day One, Day Two, Day Three and Day Five! If there are things that you don’t find on the 4-chairs website, you can just click on their “contact us” link and ask Lindy directly about the specific item. She will either know where to get it or will order one for you. She’s great! This house has it all!!!! Fun for everyone! So fun, so beautiful. I'm amazed by every room of this house! Aren't you? Right? I can't wait for more tomorrow!! I am seriously in love. Forget men and chocolate, I want this house! I cannot wait for tomorrows pictures! Erin, I love your blog. Believe it or not turquoise used to be one of my least favourite colours but over the last couple of years there has been a shift and I love it so much now. Your blog definitely contributed to my change of attitude. Thank you so much for all of your hard work. So inspiring! Have a great day. 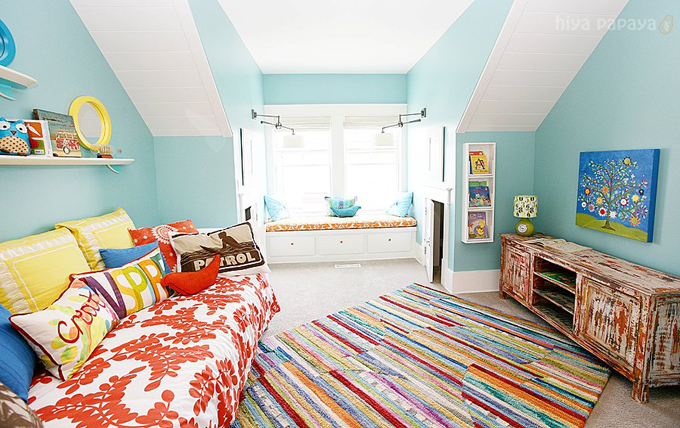 I love the colorful rug in the kids room, any idea where it came from? *gasp*!!! I wanna be their friend!! I toured this house yesterday! It's part of the Utah Valley Parade of Homes! It was just stunning in person! Turquoise pool table? Damn … they DID think of everything. I'm loving the very Amy Butler-esque craft room too! I am loving this home tour! I have always wondered what it would be like to have a home completly finished. So pretty. I am so obsessed with this post. That nursery is what I have in mind for when I have a LO. We nominated you for the Versatile blogger award, head over to our blog and claim your badge! I love this more than you know!! How could you ever be in a grumpy mood in such a fun house?? oh my goodness, I need Lindy Allen on speed dial! This is absolutely the most fun house I've ever seen. The bathroom is so spot on – how great is the tile floor? I'm loving this home tour! Lots of color but very nicely done and this looks like it would be lots of fun to live in. happy house! I'm sure happy people live there…wonderful find! 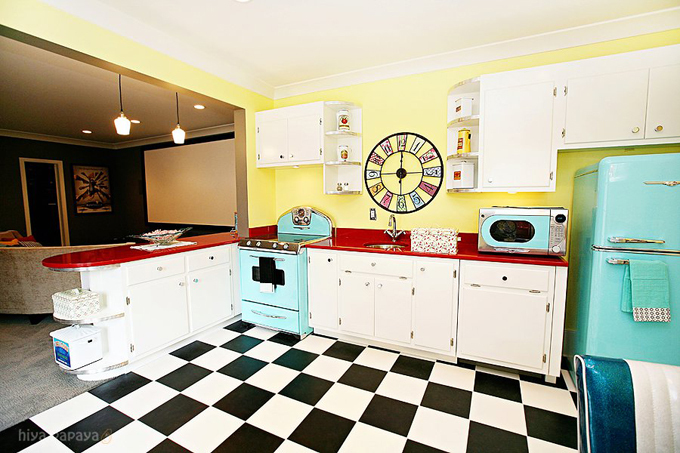 Love the last kitchen, it looks like the kitchen off Roger Rabbit! Love the colors. Would they be willing to share the paint color they used in that first photo? 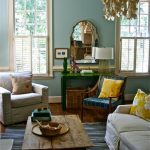 Thanks for blogging this beautiful home! The more of this house I see, the more I fall in love with it! The basement is GENIUS! That bathroom is adorable, perfect. And the crafts room is to die for. There are touches of turquoise in the fabric too. Gotta have that turquoise. One question, where did you get that painting in the pool room? Love it. 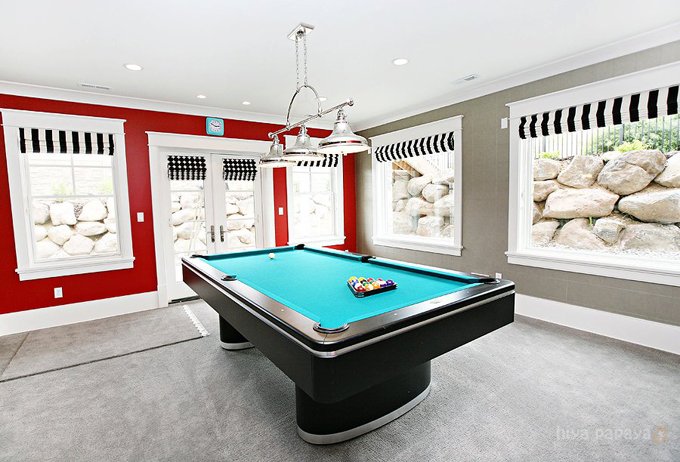 Oh and the turquoise pool table? I'd never seen a turquoise one. PS…I too am a huge turquoise fan! This home just makes you SMILE :). So FUN and inviting!! 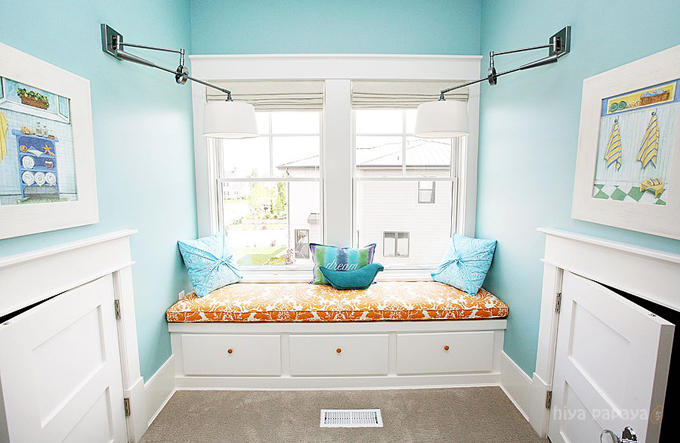 Would you be willing to share the paint color in the upstairs playroom and nursery bathroom? absolutely loved it! cant wait to see more!! What a fun home! Fun, cheery and whimsical. The nursery is adorable. I adore the glass knobs on the doors, too. 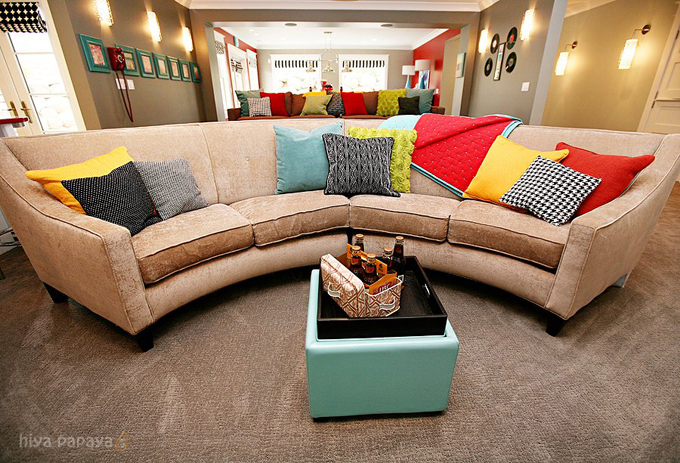 The playroom is so bold and bright. How could you not want to play in there! That is a great space for her kids. Thanks for the tour! 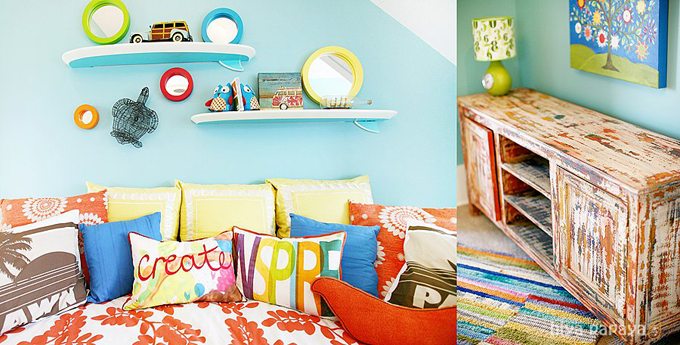 Fabulous kids room and bathroom! The colors are amazing. This is such an incredible house. Every detail has been thought through and it shows. Thanks for this incredible series and thank you to the homeowners for sharing their home. Okay! Here to answer as many questions as I can! * The paintings on the wall in pictures 1 and 3 came from Four Chairs Furniture. I think that's it for now. Please let me know if you have any more questions!! I would love to know where the daisy print came from that was in the entry area. I looked on four chairs but they don't have it on their web site. Where did the orange bedding come from? What is the paint color in the yellow bathroom? I have major craft space envy!! Absolutely love Day Four! Oh, wow! I just adore the children's bathroom…well pretty much everything! :) Could you at all find out where they got those AMAZING door knobs in the children's room/bathroom? Thank you so much! Would you share the paint color of the basement walls- it looks like a gray green? Absolutely, love the feel of this home. Both the home owner and the designer did a great job making this home beautiful, casual and comfortable. The orange duvet cover is from Pine Cone Hill. It is called the Erika Persimmon Duvet Cover. Pine Cone Hill does have a website you can buy directly from as well as being sold in stores. You can see the Tree picture (from the colorful bedroom) at the website http://www.oopsydaisy.com It is called the Tree of Life. Oopsy Daisy has a lot of great art "for kids" that is not too babyish or childlike. If a designer or store has Oopsy Daisy as one of their vendors they would be able to order you anything from them. Oooh, Rene – thanks for that info!! I didn't know either of those sources exactly since I just got the stuff directly through Lindy at Four Chairs. Happy to pass along the information. Thanks again! I absolutely love that you aren't afraid of color! I feel like the style these days is borderline mental institution with all the white and simplicity. LOVE IT! This home is out of this world amazing!!! I can't get over how awesome it is!!! Beautiful! thanks for sharing it! My jaw hurts from being left open—WOW, the COLOR is amazing!!! I LOVE color!!!!! This house really is amazing in person. 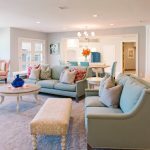 I went through it during the parade of homes & it is like no other house I've ever seen! What is the paint color in the nursery?? I Love it! 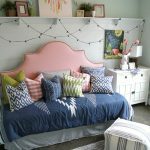 The nursery is an inspiration! Love Love Love it! 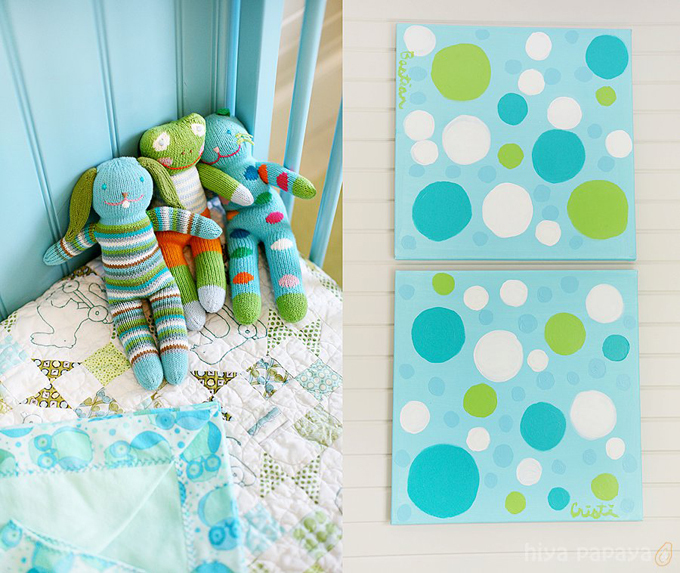 I'm attempting a neutral nursery, and this has some great ideas!! Could you please tell me where to find the ligh fixture in the craftroom (the black ceiling fixture)? It's fabulous! Any idea what yellow paint was used in the kitchen? 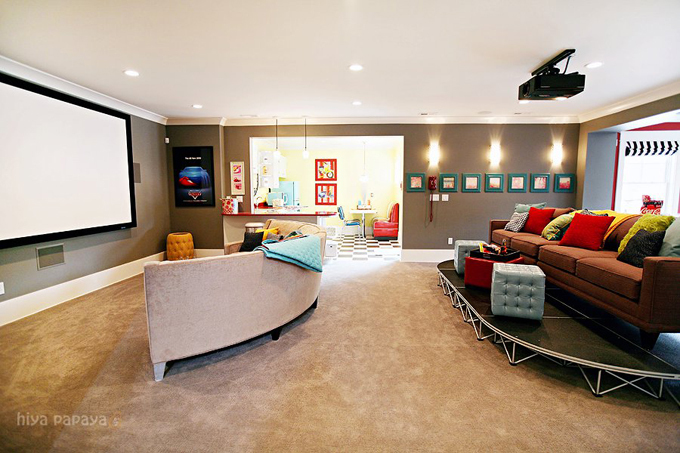 What about the taupe/grey in the basement theater room? Thanks!!! some of you have asked about the grey in the media room – it's not paint! it's another Thibaut! Tuscany Leather performance vinyl wallcovering in Metallic Pewter from Texture Resource Volume 3! What a stunning home…obviously a lot of time, love and inspiration went into this house. I would love to know where you found the orange rustic furniture piece in the kids playroom? Thanks for your help! One last question…..where did you find those amazing bright colored collection of circle mirrors in the playroom? Can anyone tell me the color of the roof on this house?